IT CAUSED havoc among community members as far as describing it Tau (lion, had nothing to do with escaped cats at Kruger National Park) or a monster. Whatever, superlatives to describe the latest Mercedes Benz CLA coupe is most welcome. Ibhubezi. The latest Merc Benz CLA is on another level hence the coining of all kinds of superlatives. Having had the privilege to test drive a sleek German is everyone’s dream and mine was awesome. Yes, this is a major facelift from fresh design, refreshed new bumpers, a diamond radiator grille, McPherson front and 18” inch new wheels, defines the CLA coupe. The black interior boasts trimmed seats as well as chromed controls. The much slimmer-looking freestanding 20.3cm media display with a new-style glass cover, an optional feature for the Audio 20 CD system and revised range of man-made Maringa suede and leather seat covers are to die for. As we took turn to North West Province to drop my Gran for family’s ceremony, all I could hear at the back was this car sounds as if it’s an aeroplane. It does not make too much sound like others, “I like it” she said gleefully. Its spacious albeit adjustable seats (enjoyed fiddling) since it carried three- adults and one kid did not seem to bother them. The only snag: they couldn’t stretch their legs as comfortable as they would have loved. An easier way to open the massive boot is via a key (striking features) or the foot in the area of the rear bumper. The optional hands-free access is now included as part of the Keyless-Go Comfort package. Its peak performance of is 280kW/475Nm and 100km/h in 8.6 seconds. 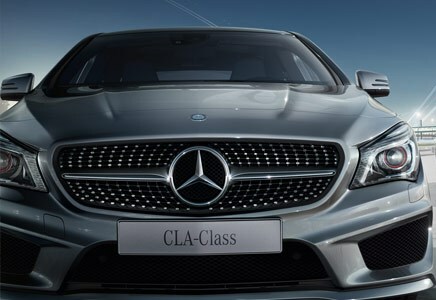 CLA petrol consumption is 5.5 litres/100km. Although, we had full tank from GP to NW-thanks to responsible driving and no hard revving and supersized torque- the only time we ‘topped-up’ was en route back. Off road. 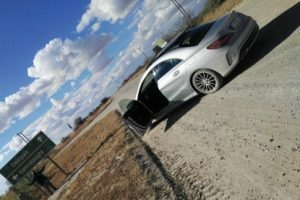 The CLA stood its ground on gravel road as we hit NW. Image SLM. It is optionally fitted with LED High Performance headlamps (standard on the CLA 250 Sport and the CLA 45). Mercedes says as all lights use LED technology, there is never a need to change a bulb over the entire service life of the vehicle. Yeah, got that? With its new CLA Coupé, Mercedes-Benz sets new benchmarks for expressive, avantgarde design. This Coupé does not merely wish to please the beholder – but rather, seduce the beholder with every line. 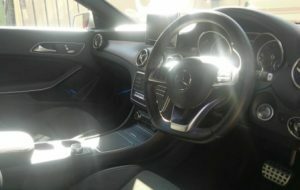 It boasts Mercedes Me Connect, multi-media systems, navigation and intelligent drive. In the evening the lights appear as bold and visible at times oncoming traffic ending up flicking for a dim but as technology would have it, this is controlled electronically. My concern has and always be the gravel or off –road one anticipates when traveling to my village. But as this (Tau) would have it, it carried itself astoundingly perfect. Top drawer. The black interior featured suede trimmed leather seats. Image SLM. opened for Heavens’ to take a view-more so after the Sun-set. A trailer coupling is now available in conjunction with the AMG Line, too.